The Reading Experience has articulated a point that I've been thinking for a while; that blogs should be doing far more than just commenting on the this and that of contemporary literature, but acting as a more reliable critical guide. It has always seemed to me that without a critical culture, its hard to agree that we have a culture. "I would like this site to focus not on new books but on books from the recent past (post-1980) that deserve additional close reading beyond the attention they received in their initial reviews, by writers who deserve careful consideration (perhaps more careful consideration than they've previously received) as writers whose work may last", he writes. I'd like to rise to this - as I'm sure a few other writers would - but there's a fear - all the work that a considered essay requires - is their a readership? I've found critical works as critical to my reading as more primary texts over the years as a good critic can be a light leading a pathway through the darkest of literary undergrowths. We have, here with our bloggers and wordpresses, the tools. Have we the intelligence to use them? It is the job of a writer to prod at the complacencies of the society we live in... and I do believe I always do this. On a day that we saw the last of Thatcher's demutualised building societies disappear into oblivion; when the pound had its biggest fall for more than a decade; and when it was the Republicans who baulked at bailing out the failed model of early 21st century century American capitalism, it is worth saying that there have been cassandras talking about this for a while, and I was one. I hid under a pseudonym for this particular experiment - mainly because my name would take up too much of a cartoon strip - but I'm indebted to the wonderful Parameter Magazine for giving me the space for my jaundiced - and it appears, prophetic - view of late twentieth century capitalism; otherwise known as TREEVILLE. Even though the musicians haven’t been paid for weeks. That we do not know where it leads. Our stupidity makes us reckless. Even though the music’s stopped. They had no market for their wares. And nobody stupid enough to buy today. I am pre-blog, and post-blog; I had a blog - online diary - before blogs existed, and now, I feel I'm vaguely post-blog in that I blog about things elsewhere, for work and other reasons. I'm probably just a link regurgitator in that sense - or, if I'm more positive about it, a communicator! Anyway you can find my thoughts on literature at the Mancunian Way at the MEN . Which tells you, you should all come along to the Old Abbey Inn on Manchester Science Park for the latest Other Room. I was at the Friends Meeting House in Manchester yesterday afternoon for a very welcome event celebrating the short story. Organised by Manchester Libraries and the National Short Story Campaign, it was an event for writers and readers of the short story. There's something always potentially a little compromising about such things but luckily Manchester has a bit of sense about such things. Three writers and a publisher - now there's a pitch for a Hollywood movie - talked about their favourite short stories, before we split into smaller groups for a couple of hour long workshops. The highlight of the day for me was just being in a stimulating environment, where the subject itself didn't require any particular case to be made for it. I've sometimes been to poetry events where there's been so much emphasis on encouraging people not to be scared by the subject, that there's been little time left for those of us who are anything but scared. I'm not sure the short story requires a campaign, or a national prize - the BBC's support of short stories is welcome, but I fear, always on their own terms, i.e. what they consider will work on radio in a particular way - rather, what it needs is readers, and opportunities for writers, preferably on a reasonably local basis. It's after all, the model that has made American literature so strong in these area over the years. For once, magazines like "Transmission" weren't present, but it was important to have local story specialists Comma here, and the attempt to show us a film of a David Constantine story on the break was a good example of how stories can transcend the page. I suppose some of our peculiarity over the short story is that its too much of a catch all, finding room for Grimm's fairy tales, alongside sci-fi, the BBC's short story spot, alongside both the nascent writer and the overly venerable. Yet, as a reader, its the place the story has in the development of the main literary trends of the 20th century that interest me. Modernism is best served in the short story, and novella; as are the post-modernist tributaries that flowed after the 2nd world war, and even contemporary greats such as the recently deceased David Foster Wallace, are, I think, likely to be remembered as much - or more - for their shorter form than the longer. In this sense, the short story remains something of the heartbeat of literature. Whatever comes next, you can be assured, will more than likely exhibit itself here first rather than in the novel. Interestingly provocative piece on the Guardian book blogs a few days ago from Andrew Gallix, asking if e-literature is a big anti-climax? I've definitely been disappointed at the way the web has gone in terms of literature - and I'm part of the problem - commentary rather than creativity. In fact, like the music business, its often the conventional rather than the experimental who have made the web their own. If in music its bands like King Crimson and Marillion communing with their fans, then on the web its writers like Susan Hill giving access to her readers. Where are the new, the young, the experimental? The web as a medium for all of those things is certainly that - but perhaps not in literature. Certainly there are a million writers on the web. A few years ago I was part of an online writing community - and the one thing all the stories had in common was there utter lack of experimentation. In many ways the ideas of "hypertext" fiction and poetry remains a valid and vivid one - but many of these "techniques" are hardly new to the web, as a trawl through the wonderful Ubu.web reminds one. A newish avant garde magazine/publisher such as Manchester's ifpthenq or Norwich's Landfill appears to prefer the traditional book/pamphlet for their non-traditional work. Just as a lot of visual poetry is more properly seen as being part of contemporary artistic practice than standing on the shoulders of literary giants, much of the more innovative web writing is hardly writing at all, in that sense, but multimedia, like Kate Pullinger's Inanimate Alice. "Media arts" is a cross genre label that can be spectacular - but where the literary component is crowded out by everything else. I think the problems around developing a truly innovative web writing are many. For though the web itself is non-linear, so much writing on the web, from this blog outwards, is entirely linear. When Elizabeth Baines wrote last year's Manchester "blog story" the tendency towards the conventional was perhaps more pronounced than in her written work - for the linear pull of the blog, episode by episode, is in itself reductionist. Its a few years since I had a few stories as part of the-phone-book.com - which has only lately gone offline. Yet here's part of the problem. The web is both there forever (thanks Google), and gone as soon as the domain name or the hosting expires. In about 2000 I wrote a somewhat experimental, episodic story about the internet called "Where do you want to go today?" and put it on the web with a vague attempt to make it as one with the medium (see image at the top - I've hunted it down off my hard disk.) The page seems terribly dated, quaint in its way. Pre-wikipedia, the idea was that things referenced in the story would be linked to. Yet, as soon as one goes out onto the internet the links start fraying, becoming dead over time. I'm fascinated as a writer, with this idea of the incomplete - and I think that the idea of "permanence" around e-lit doesn't particularly worry me. Yet there remains the question: how can the words exist when the medium no longer does? Laurence Sterne and B.S. Johnson rely on their book origins - and neither would gain from being available as text files. Yet, surely a facsimile of "On the Road" would be a wonderful blog? In the end, of course, it comes down to the writing - and very few of our best writers have made their work available on the web, at the expense of the print - and as for the others, who'll remember them anyway? I'm thinking back to what I was trying to do with "Where do you want to go today?" and some other work I'd done at that time - I was into "exploding" the short story. Yet, as its recent partial renaissance has shown, the story doesn't want to be exploded. It is Carver, Mansfield, Chekhov who are more often than not the models, less so Borges. Those stories I've made available on the web are not always linear (see The Personals, for instance) but they are page-bound. For me, at least, the difficulty with doing something else - something more appropriate to the medium - is twofold; one, where is the audience? and two, have I the skills. Compared with a media artist or some digital production team, the increased sophistication of much media art these days means that the lone writer is no longer able to get away with something as simplistic as a hypertext story; whilst with a few honourable exceptions, such as Great Works, many web magazines are highly traditional. Its perhaps time - as Gallix implies, in his comments if not in the initial article - for us to look at the possibilities of eLit with new eyes: an underexplored arm of contemporary literature - and it has to be literature, not anima, or podcasts, or media art - that is still waiting for a writer or two to make it their own. I've been keeping a north eye on Harper Collins' "online slushpile" experiment - Authonomy - and have now made available the last longer piece of fiction I wrote, the novella "For the Want of a Gas Barbecue." I'll be interested to see if it finds a readership - or what sort of comments it gets. I was involved a few years ago with an online writing community which went from being very positive, to being somewhat negative (not just for myself), in a short period, and there's been quite a few other experiments over the years. This does at least seem to have a sensible "model" - it was easy to upload the chapters, and immediately you've got a "shop front". As for the novella, its the perfect one to test this out - since its a novella, which I think is a difficult length to sell, but probably quite fun to read on the web - and its also contemporary, lively and humorous. You can read it for yourself at Authonomy. Economics is rarely the stuff of literature, more, I think, because very few writers have more than a basic understanding of economics, rather than there being something inherently unliterary about it. I say its rarely the stuff of literature, but I guess it depends on definition. George Eliot's novels were steeped in the socio-economics of the day, and even Jane Austen's novels were routed in the economics of her day (think of Rochester's history in the plantations, or the "entail" that is the cause of so much worry in "Pride and Prejudice.") Of course, Ezra Pound's attempts to leverage a particular economic theory into the cantos was doomed as much for literary reasons as for the dubious politics underpinning those economics; and Ayn Rand's mammoth "Atlas Shrugged" shows that though its possible to write a novel about capitalism, its possibly not that wise. Science fiction has often done it better of course - a particular favourite is "Monument" by Lloyd Biggle about a man who crash lands on a beautiful planet and gives them a plan for their development in preparation for the day when the planet gets found and exploited. Jim Crace's "Arcadia", is my favourite of his novels, telling the story of a multi-millionaire who begins with nothing. But faced with the "credit crunch", the dissolution of investment banks, the merger of high street names, the nationalisation of financial institutions and the banning of "short selling", its no wonder that fiction holds up its hands. Merchant bankers make poor heroes, though Sherman McCoy in "Bonfire of the Vanities" is an honourable exception. Yet financial crises are classic pieces of real life plotting - "black swans" if you like, or unknown unknowns - that can turn the impossible to the inevitable with a speed that is breathtaking. It will have to be seen whether some future novelist finds a gem of a story in the current "credit crunch," but two very honourable mentions of past financial crises turned into art are Jay McInerney's stunning "Brightness Falls" and Michael Bracewell's English equivalent, "The Conclave." An enterprising publisher should bring the latter back into print. Perhaps the next J.K. Rowling novel will be about economics - or politics. There's certainly some useful dramatic timing in her £1 million donation to the Labour Party being announced on the eve of the Labour Party Conference. I'll be popping into town later, to see what gridlock for Gordon is like this year. Last time the conference came to Manchester, it was nearly impossible to get into work, with half the city centre cordoned off for security purposes. I've never wanted to be a journalist, so it's perhaps hardly surprising that I've never stepped into a newsroom - at least not until Wednesday, when, along with over a dozen other Manchester bloggers I was invited by Sarah Hartley to the new Manchester Evening News offices. Its a fascinating sign of the times to be ushered into the heart of Manchester's "old media", albeit a rather state-of-the-art heart. After all, isn't this the year that the blogging community and the cult of the amateur has been most derided? A friend used to work for London's News Network, and ten years ago I went into their offices a number of times - what struck me here was that print media is still a people-business, rows and rows of them, (though not that many there at 6.00 on a Wednesday), designers, writers, reporters, subs, editors. For every page of a paper still needs to be sourced, written, designed, published, and this is in every way a 24-hour news operation, with that almost-a-video-blog Channel M, and Manchester Online broadcast from the same offices. And like every journalist I've ever spoken to, they're not too proud where they get the story from - readers comments and blogs being part of their feedback loop. And most of Wednesday's bloggers were anything but amateur - as anyone who has kept up with Manchester Blog Awards over the last couple of years would be sure of. It felt like a rare opportunity for two conflicting worlds to get to understand each other a little more. With City Life, so summarily dismissed by Guardian Media Group a few years back, about to be relaunched as a flagship online brand its clear that the media landscape has changed to the extent that anyone interested in the city's more edgy side will be bookmarking blogs, rather than checking out a clunky corporate, and City Life's need to negotiate the two will be fascinating to see. Work - as well as technical incompetency (I know, I know) - might prevent me from listening to Elizabeth Baines short story being read on Radio 4 later today, and may well prevent me from attending a very exciting sounding "other room" the week after next, but I will try. I'm certainly in Cambridge the following day when the next of Martin Amis's public lectures, about old family friend Philip Larkin, takes place. It is to other blogs I direct you today. First to Ready Steady Book, who break the news, via the Associated Press, that the great American writer and essayist David Foster Wallace has committed suicide at 46. There are few contemporary writers who have consistently proved their exception talent, and even though I've not read his massive "Infinite Jest". A very sad day, a great loss. I know Lee Rourke at Scarecrow will be shocked by the news. His comment on the Booker Prize list this year is one that I would probably echo. The judges appear to like well-written stories, preferably historical. I can't comment on the books themselves having not read any of them, but I'd agree with Lee that the prize is becoming ever more an irrelevance - if, as you'd expect, its role was to identify the best contemporary fiction. Its only a month to the Manchester Literature Festival and as ever, I'll try and go to a thing or two, but know full well that I won't get to more than a few things. Bumping into MMU's Andrew Biswell earlier in the week, he mentioned the opening event, a poetry reading at the RNCM, including the awarding of the first Manchester Poetry Prize. I hardly know where to start in talking about Ford Madox Ford's "The Good Soldier". Having read two contemporary prize winners in the week before, it wasn't that this novel was necessarily better, older, or more venerable than them - in fact, at times its language and style was a little tiresome - yet, when push came to shove I felt I'd read something of real substance, and its been a while since a contemporary novel has that to be said about it. We live in an age of froth and I think that it spills over into most contemporary fiction. It's hard, I know, since the first quarter of the 20th century provided more than its fair share of literary thrills - turning the Victorian novel personal in many ways. How can one deal with such archetypes? Enough. Back to "The Good Soldier." It starts as "Wuthering Heights" does, with an apologetic narrator, but whereas that story is framed, this is told from experience. It's the most enigmatic of novels, not just the "saddest story" of that famous first paragraph. Where is the sadness in the novel? For those who haven't read it - it's the story of two couples, one American, one English, who have met for a number of years at a German spa. Each couple has an "invalid", and it these invalids who are the book's tragic love story. Yet, it is their caring partners - one of whom is our narrator - who are more intriguing. This is a story of passion, told through a prism of weakness. It unfolds slowly, as a story told around a fire. I don't believe our narrator is the key figure of the novel, nor the affair. It is - primarily - a tragedy - of emotions either smouldering or snuffed out on the anvil of a particular time in history. It is new America beholden to old Europe at the start of the conflagration - the Great War - that will then swap over those roles for a hundred years. Having just read Ford Madox Ford's remarkable novel "The Good Soldier" (more of which later) I wondered if I had a biography of him. 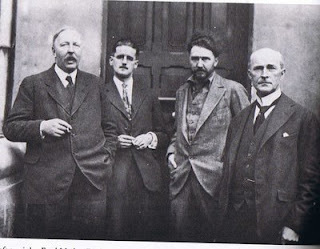 He seems not to have been "done" for a while; but I did find this picture from John Tytell's "Ezra Pound: The Solitary Volcano" with Ford to the left of Joyce, Pound and John Quinn in 1922. "The Good Soldier" is nothing if not a novel about and for adults, so, even if this picture is seven years after its publication, its quite nice to see he was a man of some substance. Tony Trehy, who curated the excellent Text festival at Bury Art Gallery, makes a very valid point about the problems of curation in our public galleries, particularly bemoaning Manchester Art Gallery's current, and popular exhibition of Lauren Child. He makes the point that Manchester can't ever be seen to be a world class city unless it has a world class gallery. It's certainly true that Manchester - despite being a hotbed of the visual arts - is always going to find it difficult to compete, not just with London, but with Liverpool and even parts of Yorkshire. The city art gallery suffers from being a civic amenity, which although it makes for a well-used space, with a "lovely cafe", has quite a schizophrenia when it comes to the shows it puts on. I suppose, that in the wider scheme of things, as one of the few sizeable public viewing spaces in the city centre, it has to double up as Manchester's V&A, it's Walker, it's Tate Modern. Remember, the popular, and utterly risible Kylie show came here from the V&A, a space that can get away with murder in the name of "design." I was disappointed in the Klimt exhibition at Liverpool Tate, because of it being too much about design and not enough about art, and I think this is more at the heart of the problem than anything else. Where else would you have put the Kylie-fest on, for instance? I rarely visit the gallery myself, at least partly because of these reasons, but also because of its very local authority opening hours. Its an absurdity that it closes at 5.00 each evening. In many ways, Manchester Art Gallery's primary function is not the travelling shows, but the permanent collection and the glorious building. I don't believe every town, every city can be a "centre of excellence" in everything, and with the Tate, the Walker and the Biennial, we should perhaps admit that Liverpool is the NW's centre of visual arts, with Manchester having other strengths, such as in literature and music. Since its still raining in Manchester, (you'll be surprised to hear), I've got on with some reading. Coincidentally, two female-authored prizewinners, Catherine O'Flynn's "What Was Lost" and Anne Enright's "The Gathering." They're both very readable books, and couldn't be more different, of course, except, like McEwan's "Atonement" beforehand, they revolve somewhat around childhood secrets. I'm wondering whether this is a contemporary trend, or is simply a recurring literary device? Children, I suppose, are almost always unreliable narrators, or unwilling witnesses to adult life. I'm wondering if the trend for memoir - particularly the "misery memoir" - is influencing the kind of subjects that get written about? Perhaps more accurately, in contemporary Britain, there aren't quite the same social mores that existed in the past. Both "The Gathering" and "What Was Lost" delve into the past, but in very different ways. I don't think its really possible to review either book in any depth without giving too much away. I enjoyed them both - and again, just as I'd heard Enright read from her novel last year, I also saw Catherine O'Flynn at Manchester Library. "What Was Lost" is the 2nd book I've read recently - after "Black Swan Green" - to mine a Midlands eighties childhood and its recognisability, as well as its humour make it a very enjoyable read. However, I wasn't expecting it to be anything more than amiable. What impressed me was how well structured the novel is, and how even the smallest of characters are given a believability. There's always a temptation, I think, for new writers, to write from life, and yet I think O'Flynn takes her raw material and creates something very powerful from it. Ostensibly the story of a young girl who goes missing in the early 80s, it is the more adult sections which give the novel weight. It might have groaned a little under the weight of its coincidences (but no more than "White Teeth" for instance), but what is really impressive is that beyond the plot and characterisation, the real star of the novel is the gigantic shopping centre where the majority of the action takes place. Not since George A. Romero's "Dawn of the Dead" has a shopping centre seemed so sinister. The novel is humorous, well-paced, and written with a nice economy that is far harder to pull off than it appears. "The Gathering" is all about its language - for Enright writes beautifully, with a real physicality that can occasionally seem a little too insistent - and its slim premise, the gathering of a large Irish family following the death of one of them, is skilfully clothed in layer after layer of memory. It should be a grim novel - but it never is - and I think its partly her voice (or the voice of Veronica, the novel's narrator), but also partly because its a very indulgent novel - not self-indulgent, that would be wrong - but indulgent in the way that its narrator is indulgent. Grief and anger and breakdown are all intertwined in her telling of the story - and of her imaginings of how her grandparents met - and as a reader you either have to go with it, or run away from such intimacy. What struck me about both books was that they without the "prizes" I doubt I'd have been interested in picking them up, they both - in very different ways - are unappealing in precis. Also, though very different in style, subject, and intention, they are both constructed with such skill and care, that I can only applaud. The idea of these two novels head-to-head in any prize seems absurd, since they are such different beasts. Let's hope this year's prize season unearths some equivalent gems. Seeing family has limited my cultural happenings. It's not that the things are mutually exclusive, just that they don't always coincide. For instance, Alnwick Gardens, is a very modern compromise. A new garden, but with public money replacing what would have been previously the landowners - and with it a new set of obligations - to let the people in, to make it ecological, to make it family friendly. A pleasant day out, with children, and on a mostly warm day last week, but I'm not sure I'd go back. Much less compromised, in some ways, was the New Art Gallery in Walsall. Shockingly, this was my first visit, but then my trips back to the Midlands tend to be short, and seeing the family. It's a great space, with any compromise between being a repository for superb collection of modern art, an exhibition space, and a community facility, being minimised by the design of the building providing room enough for all. On Saturday, it was particularly busy, which goes some way to justify why we should have art galleries not just in our minor towns, but when we do, that they should be close to the city centre, allowing easy drop-in. There's something inspiring about the story here: that the Garman Ryan collection was donated to Walsall since that was where Kathleen Garman, lover and wife of Jacob Epstein was born. Inspiring, because, almost unbelievably, Walsall, that least impressive of industrial towns, is connected by her, to the very heart of 20th century Modernism. I'd missed the film Hellboy when it was on Five a couple of weeks ago, so watched the DVD last night. It wasn't bad, if you like that kind of thing, with a nice line in humour, but I kind of remembered, half way through, that I don't really like that kind of thing, not much anyhow - and, as I get back to reading Anne Enright's Booker winning "The Gathering", I'm pleased I heard her read from it at the Manchester Literature Festival, since I've got her Irish accent keeping me company throughout. The book's probably not my kind of thing either, but I'm enjoying the company at least.